Beijing, China - Room502, Building 1, Dushixinyuan, Dongxinglong St., (west Of The New World Shopping Mall) Chongwenmenwai St.
Center of the city, walking distance to Forbidden City, beside of the local shopping area. 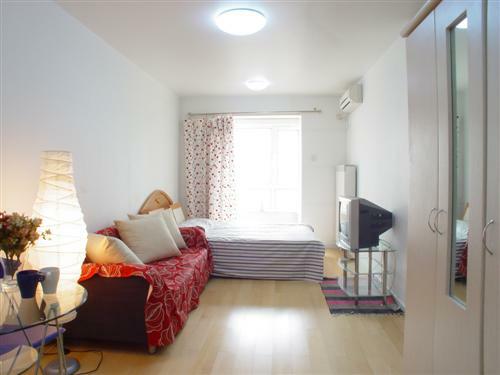 Convenient, comfy and quiet studio serviced apartments with private bathroom and kitchenette for daily rental. The apartments' building is located in the old Beijing centre -- Chongwenmen, nearby the Forbidden City (15 minutes walks away) and Temple of Heaven (10 minutes walks away). Also it's a local shopping area as its important and convenient location. Its 3 minutes away from 3 huge shopping malls but also 5 minutes opposite direction, you could find the oldest Beijing neighbourhood- Courtyard and Hutong! For more information and map, please visit our website stayinbeijing. 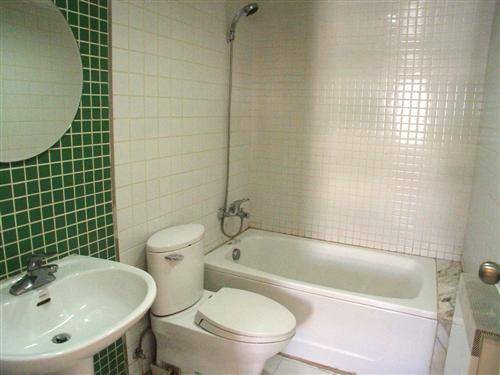 Studio Apartments: with a Queen Size bed, Kitchenette, private bathroom, washing machine. Large Studio Apartments (Triple): Living space and bedroom space, with a Queen Size bed plus a futon (for 3 people or 4); Kitchenette, private bathroom, washing machine. 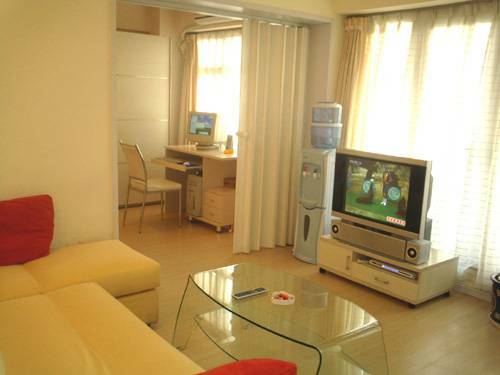 2-Bedroom Apartment (Max 5 ppl): Queen Size bed, Twin beds, and futon; 1~ 2 bathrooms, kitchen, washing machine. Because we only have few 2-Bedroom apt, please email us directly for checking availability thanks! The apartments are comfortable, clean and quiet. They are decorated around 3 years ago. 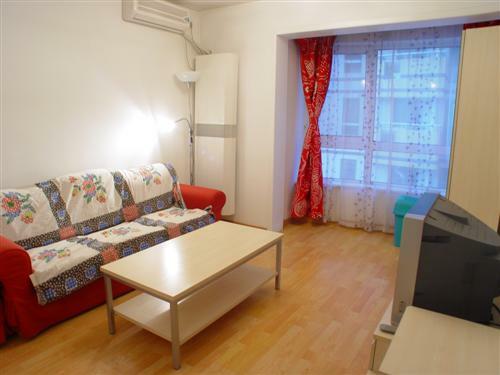 Those studio apartments are quite small (25 square meters) but enough for 2 people, also it's with a very reasonable price in such convenient location! 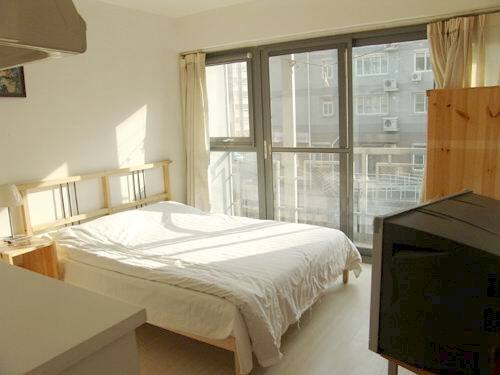 The Large Studio apartments are much bigger (35 square meters) but for 100RMB more. 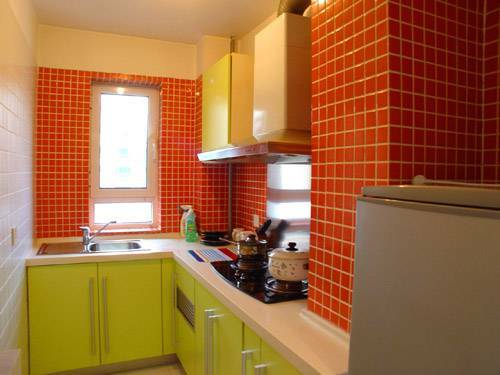 The 2-Bedroom apartments are around 80 square meters with 2 bedrooms, 1 living room, 2 bathrooms, and kitchen. All kitchens are equipped with basic kitchen appliance. We will email you the contact number, location map and address both in chinese and english after booking. Please make sure you let us know when you will arrive so that everything is prepared. Also be aware that we secure each booking until 6pm, so if you will arrive later please kindly contact us before 6pm, we will absolutely keep the room for you as soon as be contacted. If you do not need an airport pick up service, please remember to call me as soon as you arrive in beijing so that we can have time to arrange a person waiting for you outside the apartments' security gate when you arrive. If you do not have a phone with you, please show my number to the taxi driver, they will be willing to call me for you. 1-bedroom Apartments: with a queen bed plus a futon (for 3 people or more). All payments are to be made in cash at the reception office at check-in time. Please note: our check-in and check-out time is 12:00 noon, if your room has had no prior guests and has been cleaned you are quite welcome to put your luggage directly in the room, alternately, you can put your luggage in our office to give you the opportunity to make the most of your day. There is a huge shopping area nearby and the Forbidden City (Palace Museum) is just a short taxi ride away. In the case of a no show or where guests do not give at least 24 hours notice of cancellation we can charge for the first night. Please make sure you let us know when you will arrive so that everything is prepared. Also be aware that we secure each booking until 6pm, so if you will arrive later please kindly contact us before 6pm, we will absolutly keep the room for you as soon as be contacted. Room502, Building 1, Dushixinyuan, Dongxinglong St., (west Of The New World Shopping Mall) Chongwenmenwai St.
10~15 minutes walks to the Tiananmen Square, Forbidden City, Temple of Heaven, Pearl Market, Wangfujing Shopping street, Beijing Railway station. 2~5 minutes walk to the Chongwenmen Subway station, the New World Shopping Mall (with supermarket), Soshow Shopping Mall, Bank of China and 3 other banks with 24 hour ATM, 2 hospital, 3 Laundries, 2 Barbershops, 2 Pharmacy, Cinema, Massage shop and many types of restaurants. Distance: 1stop by subway or 15 minutes walks. Distance: 15 minutes walks or 5 minutes by taxi. Distance: 4 stops by subway or 15 minutes walks. Distance: 6 stops by subway or 20 minutes by taxi. Distance: 3 stops by subway or 10 minutes by taxi. Theatres: Acrobatic, Beijing Opera, Chinese Kong Fu Show all in 10 minutes taxi driving distance.